We are enlisted amongst the famed Manufacturers and Suppliers of Dome Bolts from Mumbai, India. 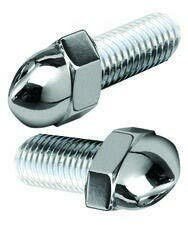 These Stainless Steel Dome Bolts are reckoned for their qualitative features of Dome Bolts including corrosion and abrasion resistance, preciseness, durability and long-working life. For user flexibility, we make them available in custom specifications. Prices quoted by us are regarded to be market-leading. Deliveries are prompt owing to our efficient logistics network.